The Atlas V rocket carrying the $1.2 Billion SBIRS GEO Flight 3 infrared imaging satellite counts as the first launch of 2017 by rocket builder United Launch Alliance (ULA) as well as the years first liftoff from Cape Canaveral. The ULA Atlas V rocket is set for liftoff on Thursday, Jan. 19 from Space Launch Complex-41 at Cape Canaveral Air Force Station in Florida. The Space Based Infrared System (SBIRS) satellite will be launched to geosynchronous transfer orbit. It is the third satellite in this series of infrared surveillance satellites that will provide rapid and accurate warning of attacking enemy strategic missiles via infrared signatures – as well as critical targeting data to US missile defense systems to enable swiftly responding launches that will hopefully destroy the attackers in the battle space arena before impacting US cities, infrastructure and military installations. The 20 story tall rocket and payload were rolled out vertically this morning some 1800 feet (600 m) from the Vertical Integration Facility (VIF) processing hangar to pad 41. The launch window opens at 7:46 p.m. EST (0046 GMT). The launch window extends for 40 minutes from 7:46-8:26 p.m. EST. Spectators are flocking into Space Coast area hotels for the super convenient dinnertime blastoff. And they will have a blast ! – if all goes well. The current launch weather forecast for Thursday, Jan. 18, calls for an 80 percent chance of acceptable weather conditions at launch time. The primary concern is for cumulus clouds. The backup launch opportunity is on Friday. In case of a scrub for any reason, technical or weather, the chances for a favorable launch drop slightly to 70% GO. The first SBIRS satellite was launched in 2011. SBIRS GEO 3 will launch southeast at an inclination of 23.29 degrees. It separate from the 2nd stage 43 minutes after liftoff. ULA has enjoyed a 100% success rate for this 69th Atlas V launch stretching back to the company’s founding back in 2006. 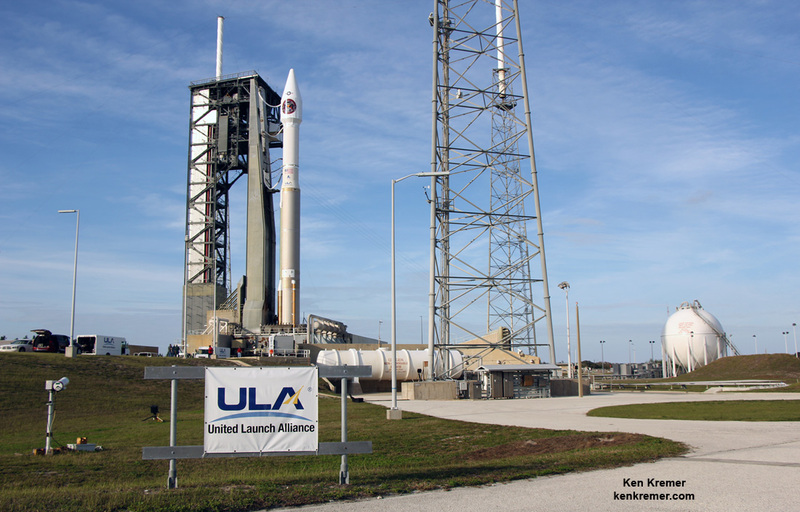 ULA is a joint venture of Boeing and Lockheed Martin with 116 successful launches under its belt.